Potentiometric level measuring principle can only be used with a minimum conductivity of 50 μS/cm for all electrically conductive media (e.g. pure water). The level probe (sensor) consists of a low-resistance measuring tube, which is immersed in an electrically conductive liquid. 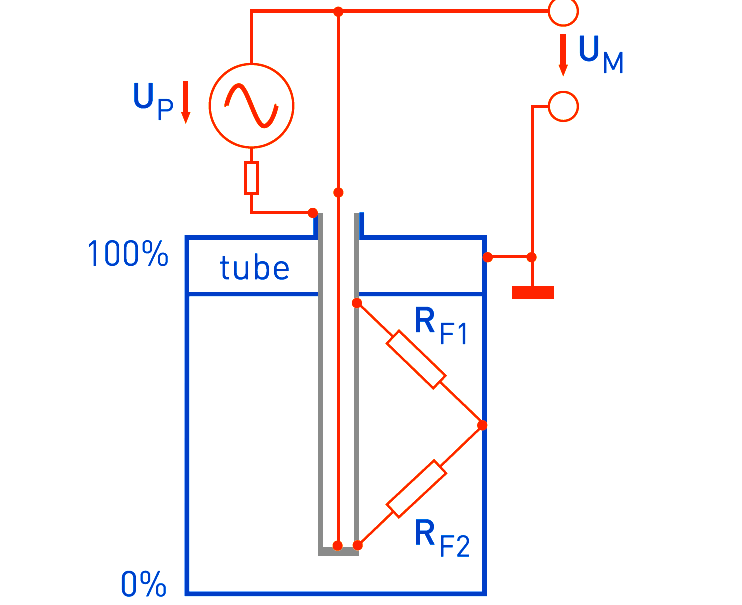 An AC generator runs a higher frequency current through the measuring tube. A voltage is taken from between the probe and the tank wall and sent to an amplifier. In homogeneous conditions in the medium, this is proportional to the level. The potentiometric measuring method is particularly suitable for measuring levels in small vessels containing tough, pasty or strongly adhesive media. The electronic evaluation unit is integrated in the signal converter and supplies a level-proportional output signal of 4 to 20 mA. For measuring level of fruit juice, ketchup, beer, toothpaste or mustard: for tough, pasty or highly adhesive media, the potentiometric level meter is the first choice. Especially in small tanks, the potentiometric measuring process can make full use of its advantages.